When you consider new flooring for your home, one of the first things that comes to mind is what the floor looks like. Gorgeous rooms with coordinated flooring are trending right now, and it’s a look that every homeowner is trying to achieve in terms of resale value and longevity of the floor. Once you have an idea of what you want your floors to look like, the next thing to investigate is the cost. 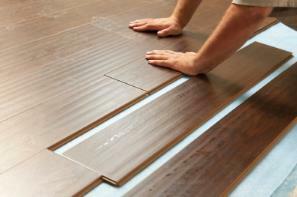 Today, we’re going to talk about an increasingly popular flooring material called laminate flooring. We’ll look at its benefits and versatility, and then see how it can make a difference in your home. Though there are plenty of critics of laminate flooring, these floors have exploded in popularity over the past few decades and for good reason. There are a lot of benefits to laminate floors that other flooring options simply don’t deliver. From its budget-conscious price to a plethora of design choices, finding a laminate floor for any room of your house is easier than ever. If you’re looking for a place to save on your home renovation budget, your laminate flooring choice might be an easy shortcut that you definitely won’t regret! Laminate is durable, with an integrated thick plank that withstands the daily rigors of people walking over it again and again. The top layer comprises a clear protective layer that resists scuffs and retains the integrity of the floor beneath. You can choose from inexpensive thin planks, which have the shortest lifespan of all laminate options, but are very budget-friendly. Another alternative is that you can splurge a little for thicker planks that hold up to even the busiest sections of your home. Thanks to modern photo-printing technologies, there are more options for laminate flooring designs now than there ever have been. Laminate is a popular replacement for wood floors, and laminate gives you the option to go for any look you please, even if the real wood alternative wouldn’t be durable enough for, say, the family kitchen or kids’ playroom. From the most realistic planks that look like real wood to more custom designs, laminate floors come in tons of varieties and textures to match your decorating style and tastes. Laminate flooring comes in interlocking planks so you can personalize a space of any size or shape. Best of all, this happens half the cost it would for you to put wood in there, not to mention the complicated installation that accompanies other floor types. Whether you are installing laminate floors in your rental property, business office, or family home, you have plenty of options open to you. And the best news? You can afford to put even the most luxurious of laminate options into your renovation plans. Laminate floors are so versatile for pretty much any setting. This type of flooring withstands the rigors of regular use, both in the home and workplace. In addition to being a cost-effective way to cut down on your flooring budget, laminate floors come with options for adding additional comfort to your home or office. Heated flooring – once considered a luxury by many – is actually a cost-effective way to heat certain portions of your home. Heated flooring is compatible with most laminate flooring options. Installers achieve heated flooring by placing heat coils beneath the floor. When the coils activate, they release residual heat that warms rooms in your home from the floor up.There are some laminate flooring options that are designed specifically to bond to heating mechanisms and allow the heat to easily escape into the room above. With this option, not only will you save money on your flooring, but you’ll reap savings on energy costs. Your home utilizes floor heat, rather than central heat, in rooms where you spend a lot of time. This is all possible by using a laminate floor. Once you decide that you want laminate floors for your home, you may face temptations from attractive online tutorials that explain how you can perform a home laminate install by yourself. You take a look at this and wonder how much more money you can save by installing these floors yourself. to help reap even greater financial savings. While we can all agree that saving money on a home renovation is great, when it comes to the quality of your floor installation, this cost-cutting measure isn’t a wise choice. Often, laminate flooring requires installation of a subfloor, special cutting and certain measures to ensure that the floor boards are flush against the wall. Further, the floor must stay attractive around room entrances near doorways. To learn more about laminate flooring and our professional installation services, get in touch with our team so we can show you what the fuss is all about when you decide on a new floor.